If you want free grant money, you have to learn grant writing. It's not so difficult, once you master a few basic grant-writing tips. Once you start grant writing, WhiteSmoke English writing software assures that you have just the right word, powerful English idioms, correct grammar and correct spelling to move your grant application to the top of the funding heap. With WhiteSmoke's specialized writing profiles that include business writing, legal writing, medical writing and creative writing, WhiteSmoke provides the help you need for writing grants. Grant writing begins with grant research--find out who is offering the money, why, and what do they expect in return? When is the deadline, what is the maximum number of words or pages (for each section and the whole grant), and what format does the grantor want the grant writer to use? When you write a grant application, you must exactly follow the grant-writing guidelines provided by the grant agency or government grant office. Most grant writing guidelines are available on the internet from the grantor. Here are some general grant writing tips to improve your writing. Grant writing tip: Always follow instructions exactly--don't write more pages or words than allowed. Provide all cover sheets, supporting documents, and forms requested. Grant writing tip: Include all of the information asked for. Answer every question clearly and completely. Grant writing tip: Your grant writing needs to have correct grammar, an appropriate style, and correct spelling. 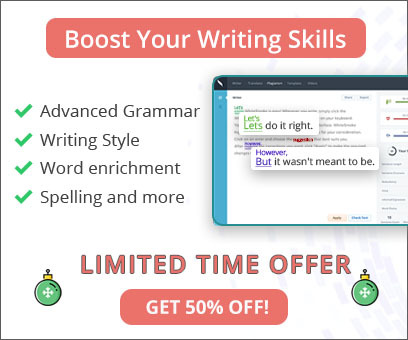 WhiteSmoke English writing software provides grammar correction, spell checker, a powerful dictionary and thesaurus, and other integrated writing tools for your grant writing. Grant writing tip: The person who reads your grant writing often has hundreds, sometimes thousands of grants to read. Write with an active and interesting style. Write using active verbs. Avoid verbs like "to be" and "to have" and all of their forms. 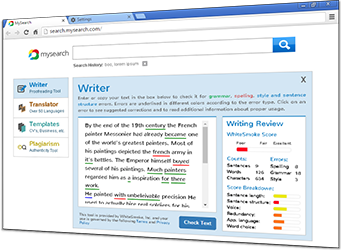 With its powerful natural language database and text enrichment features, WhiteSmoke will improve your English writing style so that your grant writing becomes powerful and exciting to read. Grant writing tip: Grantors don't offer free grants. They want the grant money to do something. Government grants and non-profit grants, foundation grants and philanthropic grants, even educational grants and Pell grants, all have a mission behind them. There is a purpose for giving the money. Write a grant so that every piece of information shows that what you will do with the money accomplishes that purpose and how it accomplishes it. Also show that you (or the client you are writing the grant for) are well-qualified and capable of doing what your writer wants you to do. Grant writing tip: Organize your grant writing according to the way the grant application guidelines organize topics and questions. If the grant application specifies sections, use those details to write the titles of your sections. Don't make the reader guess about where to find the information they asked for, or you will be guessing about where your grant money is coming from. One final word for the grant writing dummy: If your grant comes in after the deadline, it will in fact have crossed the line and it will be dead-on-arrival. Make certain that you don't send a grant in late!